if you go to the motoguzzi usa site and look at bikes, then click on accessories they are listed with an MSRP. It's raining today, so, today, it isn't killing me. Tomorrow might be another story. Saturday will be here soon enough. I've got one. I don't know where it is right now, but, I've got one. Just remember that if you use one connected to a battery tender and you leave your phone/tablet/GPS plugged in it is draining the battery. I like my USB connections to be switched. Actually, you don't even have to leave anything plugged into it to drain your battery. Those adapters have an digital voltage regulator 12-volts to 5 volts (it's actually a small switching power supply). That circuit uses a little it of power by itself w/o anything even plugged into it, just like the ubiquitous power bricks and electronics chargers draw a small amount of AC from the wall socket even when nothing is connected to them. Good point - and that might be an issue for someone who wants to mount a GPS or something (which is probably why Guzzi put the switched power connector there). But for someone like me who would only want it to charge something while he was riding, I'd never walk away with the wires hanging off the bike so it's less of a concern. OP - when you get around to it, let us know if that connector under the headlight is indeed a fit (and while you're at it, do you have a V7 Stone or V7II Stone)? On the V7-II there is a spare plug under the seat for the usb adapter (tucked down behind the ABS fuse holder and the EMU interface plug holder). I saw it on the wiring diagram a while back, got curious and tracked it down. This is not the same as the Tom Tom plug behind the headlight. The usb adapter plug is the same as the type shown in the usb adapter picture. I just installed this part on the picture - GU2000166 - on my MG V7 II special today. It took me about two hours - the connector is pretty hard to find and I almost gave up at some point, before calling the dealership who sold it to me and said that it's 'somewhere there'. The connector for this part is under the seat of the V7 II, not behind the headlight. You need to remove the right-hand side cover to find it, and in my case, I also had to remove the battery. Then you see a spare connector bundled together with a bunch of other wires. Once you see it, remove the cover of it and plug the USB socket kit. Then put back the battery and back the right-hand side cover of the bike. The piece that helps to keep the USB plug firm should be placed on the left-hand side pre-screwed opening under your seat (not the right-hand side one) with the included bolt. Then you fasten the USB plug with the two pig tails on top of it, not to move around. At least that's how I did it and it seems to work. It's not so hard, the hard part is finding the connector, once you do the rest is easy. First I had confused the USB connector with a plug visible just under the seat, but this one seems to be the diagnostics plug, so one needs to look harder. Thanks Gioco, good description & thanks for tracking it down. I can use that.It didn't make sense for it to be the connector to the ECU. I'll be home on Saturday afternoon in Elmhurst Queens if you want to look at your options. I taught Cam everything he knows. 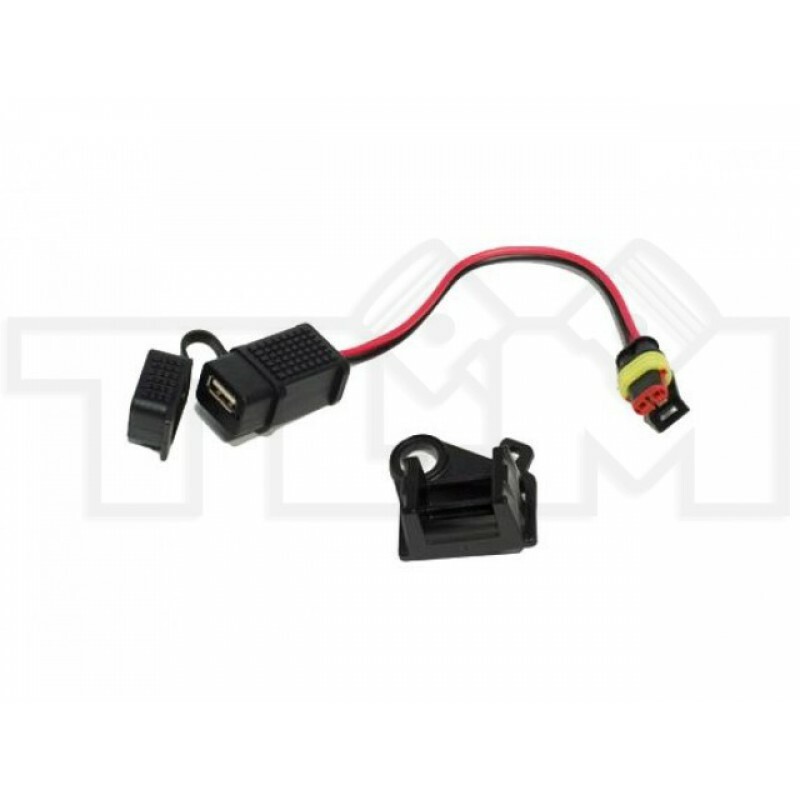 Pictured below is a battery tender pigtail, a USB charging port and a digital battery gauge. Useful! Sorry, I thought this would help to tell you where to look. I didn't need to take off the side cover or remove the battery, just shone a torch down behind the air filter to see the plug then (gently) pulled the cable till the plug came free. I bought the USB charger plug pictured from AF-1. It works great and fits perfectly. It mounts under the seat and a charginging cord can be plugged into it and run under the fuel tank to the handlebars or wherever. It plugs directly into a connector also located under the seat. At first the connector my be a little difficult to see and find because it is stuffed between the fuse holder and the rear fender. There are actually several (3 I believe) unused connectors bundled together. Sorry I am to stupid to post pictures or I would, but the connector is there and the hole for mounting this plug is there and it all fits together perfectly and works perfectly and is not just some devious plot by MG to screw us. And no, this is definitely not the same as the connector behind the headlight, this USB charger is not meant to connect to that connector and will not plug into it, it fits and connects under the seat. In the future I will strive to tolerate everything except intolerance and to hate nothing except hatred.